With Bramante (1444-1514) we move into the Renaissance, a brief period of utterly harmonious architecture based on the research and performance of the quattrocento architects. More particularly, it is the fruit of Alberti’s efforts who died thirty years before the first Renaissance building was designed. In 1499 the invading forces of Louis XII of France captured Milan. Leonardo went home to Florence; Bramante went to Rome. 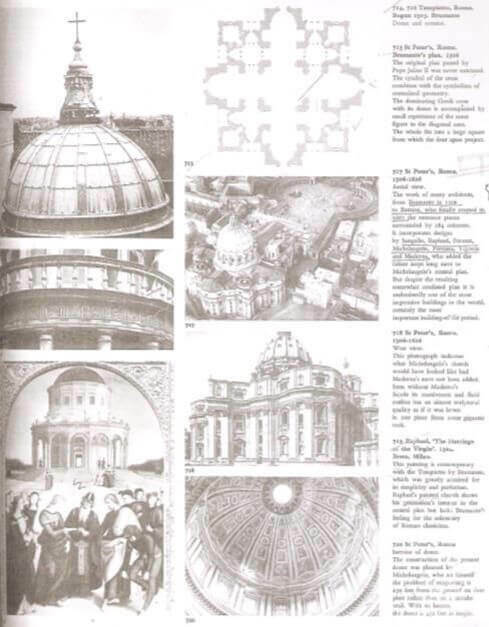 There he studied ancient ruins, and there he designed the most important buildings of the Renaissance. High Renaissance belongs to Rome, in the way that early renaissance belongs to Florence, but with one significant difference: Rome attracted and patronized great artists and architects; she did not bear them herself. In the fifteenth century some efforts had been made to rescue Rome from her medieval impoverishment and rebuilding of St. Peter’s was considered.